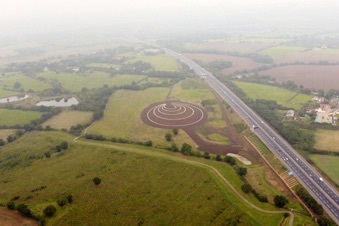 The sculpture is just outside Theydon Bois and is clearly visible from the M11 motorway - on the left before the M25 junction when travelling north towards Cambridge. 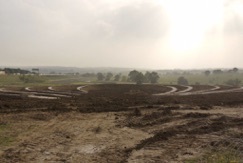 The soil for the sculpture comes entirely from the site itself, shaped into a series of concentric earth mounds; these carry paths that people will be able to walk. 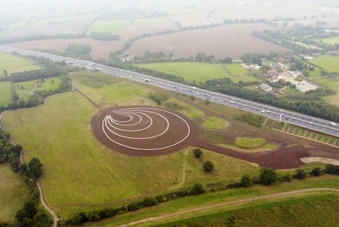 The base of each mound will be planted with a different species of native tree. The paths will have an individual feeling and atmosphere, due to the characteristics and growth patterns of each specific species of tree. These trees - Hornbeam, birch, oak, lime and hazel will all be coppiced (cut to just above the ground every 7-15 years). 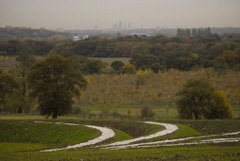 The earthwork and paths will gradually disappear from view as the trees grow (as will the distant views of London from the paths), to be revealed again when the trees are cut. Theydon Bois has been planted with over 30,000 native trees since the Woodland Trust acquired the site in 2006, with funding support from Essex County Council. Substantial numbers of trees were planted by local people from a wide range of groups across Essex and London. 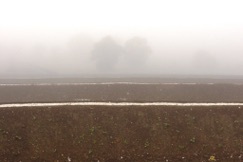 2013 - Earth, chalk and flint, trees to be planted. 140m x 115m x 2m high. 1,000m of paths.